Access: Business. 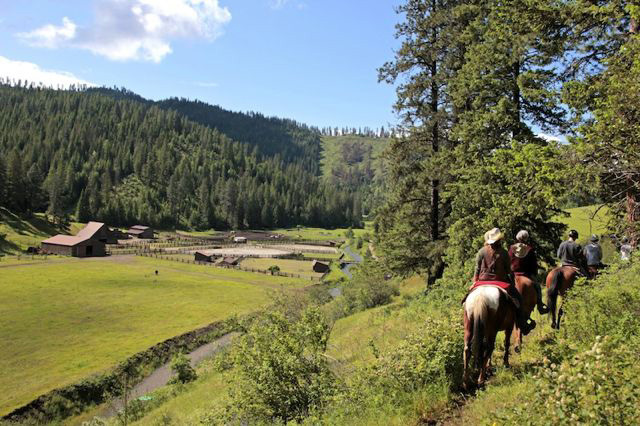 Award winning, family-friendly destination dude ranch, providing western-style horseback riding and outdoor adventure since 2005. From Harrison take ID-97 north across the Coeur d'Alene River. Go right onto E. Blue Lake Rd for 5.4 miles. Turn left to the ranch. Reservations required. 888-689-9680, #1. 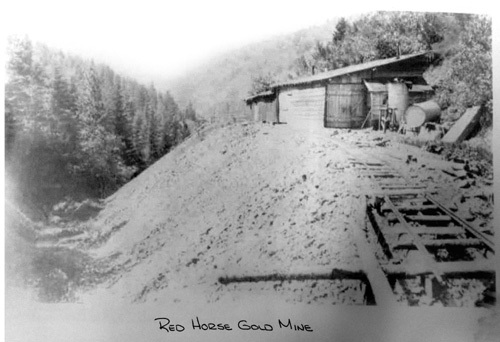 The current owners of the 600-acre Red Horse Mountain Ranch trace the history of the property to the Red Horse Mine at the foot of Red Horse Mountain. The boom of the mine didn’t last, but remnants of the old workings remain. 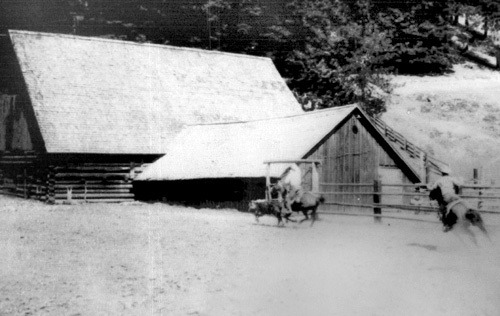 In the late 1800s parts of the Red Horse Mountain Ranch were owned by many different homesteaders. They cleared land, built log cabins, and farmed. John and Mirtle Nederhood also homesteaded on the present ranch property in 1904. Mr. Nederhood built a log chute that shot logs into the north end of Blue Lake. A Russell & Pugh Logging railroad led to the same locale. John worked for the Red Horse Mining company. The couple had four children: Maude, Albert, Oliver, and Nellie -- the last of which was born three weeks after John died at age 36 from quick consumption, a miner's disease. Myrtle stayed at the ranch, vowing to keep the children in school. Marie and Joseph Jenicek and their 8 children from the Czech Lands moved to the area in 1927 and lived on property that would become part of Red Horse Mountain Ranch. Their house is still standing, though it has been renovated. It is known as “The Homestead” and is used by Red Horse staff. One of the Jenicek children was Charlie. He started a bar in Harrison that is now known as “One Shot Charlies,” and renowned throughout the Inland Northwest. Other families lived and worked the land around Blue Lake and Red Horse Mountain, but not all have been recorded. It was common for folks to show up, log the property, sell it, and pack up and leave. The man credited with piecing all these homesteads into one large privately held estate was John Harvey Kelly of Spokane. He was a freight boat driver for a railroad construction company and became concerned about loosing his job during the money panic of 1907. He filed on a 40-acre homestead as a hedge against hard financial times. Kelly determined that property with plenty of fish, game, and building materials would provide security far into the future. "In such a location I could hole up indefinitely on a very few dollars," Kelly wrote. At about that time, homesteader Happy Jack McCloud filed on the entire west shore of Blue Lake, but he fell into some trouble and fled to Canada, never to return. Kelly took advantage of McCloud's disappearance and his understanding of homestead law to acquire his lakefront acreage in 1915. Kelly's parents and two siblings joined him on the land and the family lived in tents while they built a modest home and farm buildings. The original home was a 22' x 28' bungalow on the lake shore. There was no access road to it for 20 years. "Seven years of hard work and delightful family life followed. Logging land clearing, building, care of live stock, riding, boating, swimming, hunting and fishing with lots of youthful spizeringtum to enjoy it are fond memories," Kelly wrote. Logs were floated from the property to mills on Lake Coeur d'Alene via a "tortuous outlet" to the Coeur d'Alene River. A right of way was acquired and Blue Lake Canal was dredged in 1915 to make the job easier. Soon thereafter, Kelly bought most of the east shore of Blue Lake. The family rented a home in Harrison to take advantage of the modern conveniences there. Within the year, most of their belongings went up in smoke during the 1917 fire. General Counsel to Labor for the Hearst newspaper syndicate. The prestigious job provided money for Kelly to increase his real estate holdings. Newspaper magnate Randolph William Hearst and other Hearst family members enjoyed many getaways to Kelly's estate. Kelly's newspaper work often took him away to New York and Chicago, but he always considered the ranch home and returned every year. Meanwhile, he continued to acquire adjacent land whenever a good deal came up, including a mile of Coeur d 'Alene River frontage. He went into raising purebred Aberdeen Angus cattle after buying two farms north of the lake. He called the place H Bar H Ranch. By 1956 he had 1,879 acres, a herd of 170 purebred cattle, along with dairy cows, horses, and mules. The Kelly's found the property too burdensome to manage in their older age and sold it in 1956 for $165,000. Much of Kelly's estate is now referred to by locals as the “Blue Lake Property.” Today, it is under separate ownership than the Red Horse Mountain Ranch. Both parcels, however, were part of a dude ranch culture that emerged in the area. John and Gladys Jones had purchased land from Frank, one of the Jenicek boys, in 1939. Their son Lloyd Jones and his wife Rowena purchased 320 acres that adjoined Harvey Kelly's land from Rudolph Ryser in 1946. They had a gift for hospitality and later operated Idaho's first dude ranch, the Bar BQ Ranch, on their property. Lloyd and Rowena partnered with Paul Sievert and a Mr. Aldinger to buy the Kelly property to expand the Bar BQ Ranch. This provided their guests with access to the lake. Accommodations included four cabins, home cooked meals, horseback rides, rodeos, and lake activities. 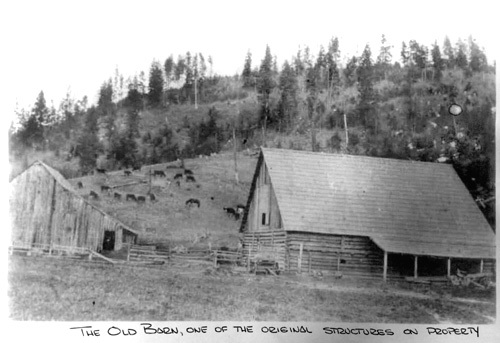 At that time, Bar BQ Ranch consisted of three "nicknamed" areas: The Home Ranch, where Lloyd and Rowena lived with their children and started the BQ Ranch; the Blue Lake Lodge, where guests began to stay after the purchase; and the Kelly Place, presently occupied by Red Horse Mountain Ranch. The Kelly Place was used for grazing cattle and had some buildings on it, but no guests stayed on that portion of the property at the time. The Jones's left the partnership in the early 70s and sold "the Kelly Place" to Albie Wells of Santa Rosa, California. He started the Timber Ridge Ranch there in 1974 and the Jones family continued to operate the Bar BQ ranch at the Home Ranch down the road. Timber Ridge guests would go to Bar BQ ranch to watch roping demonstrations by Gene Davis, Lloyd Jones, and Lonnie Jones. Others purchased the Blue Lake property. Wells completed the lodge in 1975, with rooms upstairs for guests. The cabins, now named Appaloosa and Syringa, were completed during that period as well. A brochure of the time described Timber Ridge Ranch as a rare blend of luxurious comfort and Old West authenticity. "Our cabins, built of native Tamarack by Charlie Scribner -- 80 years young and one of the last master log builders -- are museum-piece replicas of the axe-man's art. The great log lodge, with its massive fireplace and enormous hand-peeled "sticks" of lodge pole pine, is yet another monument to the all-but-vanished craftsmanship of our pioneer past. And our tall teepees, standing in firelight silhouette against the evening sky, are a last remembrance of a splendid era when only the proud Indian and intrepid mountain man walked this unspoiled land." An article in the Searchlight said "the cabins built at Timber Ridge are of significant historical consequence since they are demonstrations of the last known artisan of this area to be able to master the type of Scandinavian dove-tail system used to assemble log homes in Finland and Sweden for centuries." Charlie Scribner preferred the Scandinavian dove-tail system because it results in tight walls that do not require mud or mortar chinking if well seasoned timber is used. Timber Ridge passed to several owners in the late 70s. When Stan Gootrad managed the ranch in 1976, he organized a 13-day pack trip from Harrison to the Lolo Trail near Kamiah. There was also cross country skiing in winter. Timber Ridge Ranch was sold to Nampa area farmer George Kawai in 1983. He and his partner, Howard Mylander of Boise, had grandiose dreams for the site, which included an upscale resort with seventy condominiums and a convention center. After numerous meetings with planners and county commissioners the plan fizzled and the place ended up on the auction block in 1991, where Kawai was able to reacquire it for $1.2 million. He put the property on the market again, this time for $6.9 million, with his mother as realtor. She tried to convince Duane Hagedone to turn it into an annex of the Coeur d'Alene resort. She also attempted to swing a deal with owners of the Sun Valley lodge, but none of that panned out. Iris Behr and John Muir bought 520 acres in 1992. They provided people experiences to help them reconnect with nature. Iris and John changed the name to Hidden Creek Ranch and ran it as a guest ranch for 13 years. They partnered with the Body, Mind & Spirit Foundation, which had a program to help those impacted by the attacks of 9/11 heal from their trauma. The therapy included a ropes course, horseback riding, and photography classes. Counseling was available to treat post-traumatic stress and grief . Red Horse Mountain Ranch started operation in 2005. Activities include horseback riding, mountain biking, kayaking, hiking, fishing, archery, shooting, and a challenge course with climbing wall and two zip lines. Sixty people can be accommodated, with two suites in the lodge and nine log cabins. The dining room offers housemade meals and pastries. There is a popular wine dinner for adults while the kids have adventures of their own. The lodge also has a lounge, gift shop, and library. Other choices are fly-casting lessons, yoga, hikes, massage, evening entertainment, and campfires. If you have information about Red Horse Mountain Ranch or the Blue Lake Property, please fill out the form. It will be forwarded to the Crane Historical Museum and Red Horse Mountain Ranch. Please use "Red Horse/Blue Lake" as the heading to your comment. Thank-you.